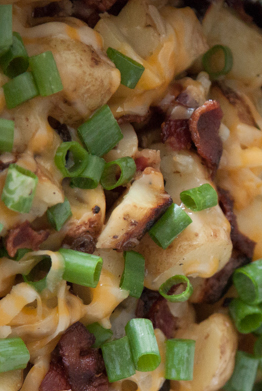 Do you have 30-40 minutes to make a delicious potato side dish? Then try out these amazing BBQ Bacon Potatoes! Cut the potatoes into cubes. Mix cubed potatoes, chopped onion, olive oil, bacon and garlic seasoning together in a large bowl. Tear 4 large sheets of aluminum foil, about 15 inches long each. Divide potato mixture evenly between the 4 sheets. Fold up the sides of each sheet to securely wrap the potato mixture. Place wrapped potatoes on the grill and cover. Let the potatoes cook for 7-8 minutes on each side. Once the potatoes are fully cooked and fork tender, you can open up the tin foil and add cheese and chopped scallions to each parcel. The cheese should fully melt within 1-4 minutes. Place wrapped potatoes on middle rack of the oven. Place a cookie sheet on the bottom rack to catch any dripping. Let the potatoes cook for 15-20 minutes on each side. You can eat the potatoes right out of the tin foil or plate them.